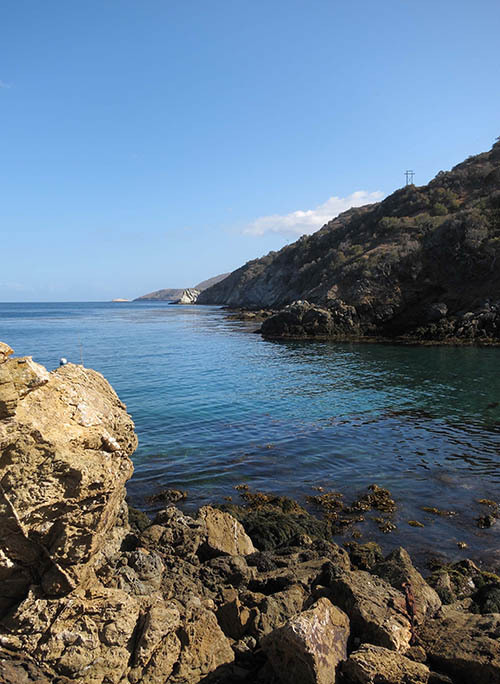 For some, escaping to Avalon on Catalina Island is getaway enough; an island vacation from the craziness of life on the busy mainland. However, some people really like to getaway and want remoteness and peace when on vacation, even if it’s just a temporary break. For those travelers, Two Harbors, located on the West End at the island’s Isthmus, is the perfect destination. Making Avalon (a mile-long stretch of a small resort town) look like Times Square, Two Harbors is a sleepy and rustic island village. 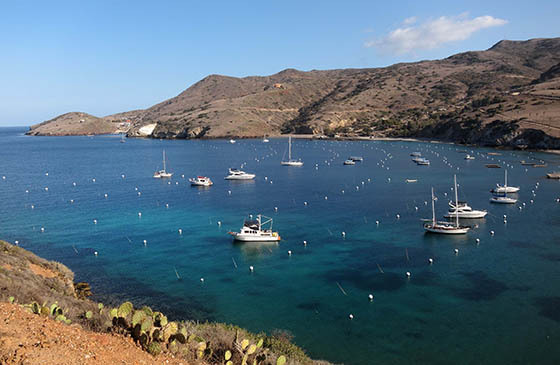 Enjoy the stunning views of both Catalina Harbor and Isthmus Cove where you can swim, snorkel, scuba dive, or rent a kayak. Stop in to the village’s one restaurant, one bar or snack shop and admire the beautiful ocean views or grab something on the go at the General Store. Explore Catalina’s interior where you’ll find plant life that is not found anywhere else…and animal life that’s just as rare. 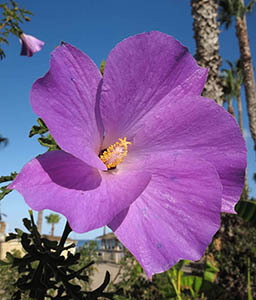 Visitors may spot Catalina fox, quail, buffalo, and even bald eagles while hiking along well-marked trails, biking over mountain roads or a high adventure tour aboard a hummer. 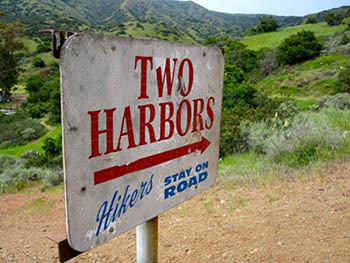 Two Harbors allows you to be in a rural setting or keep to your urban likings by staying close to the amenities. 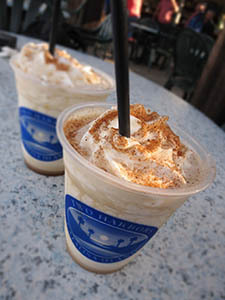 Two Harbors is also the birth place of the island’s signature cocktail, Buffalo Milk—a delicious blend of Crème de Cocoa, Kalua, Crème de Banana, and vodka. You have to have at least one when visiting. Nothing says island vacation like a beautiful view and a good, tropical drink. 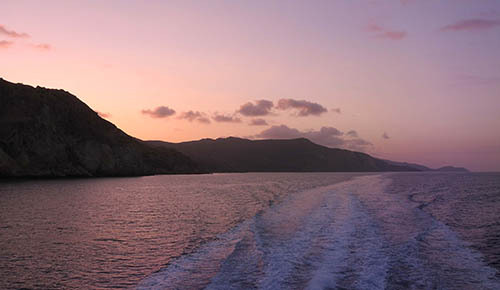 To get to Two Harbors you can take Catalina Express from San Pedro or you can go from Avalon. Direct travel from San Pedro takes approximately 1 hour and 15 minutes; from Avalon it’s an additional 45 minute ride. 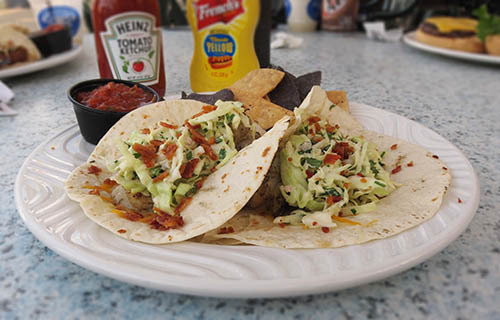 If you’re leaving from San Pedro, definitely check out the Catalina Bistro at Catalina Sea and Air Terminal for breakfast or lunch. During our recent trip to Two Harbors, we had a feast for breakfast that fueled us for the rest of the day. Leaving overcast San Pedro behind, we enjoyed a wonderful ride to Avalon and then made our way to Two Harbors—greeted by a spectacular day on the island. Get to Two Harbors and it’s quiet and serene and picturesque. While there are a slew of activities you can opt for (snorkeling, scuba diving, kayaking, bicycling), we decided to go for a leisurely hike. Walking a few miles in one direction, we made our way to a lovely cove and just took in the wondrous sites. Back in the heart of Two Harbors, we had lunch at The West End Galley, which offers a wide variety of breakfast and lunch entrees, including fresh baked cinnamon rolls, coffee, breakfast burritos, freshly made sandwiches, a generous selection of burgers, pizzas, specialty salads and wraps. 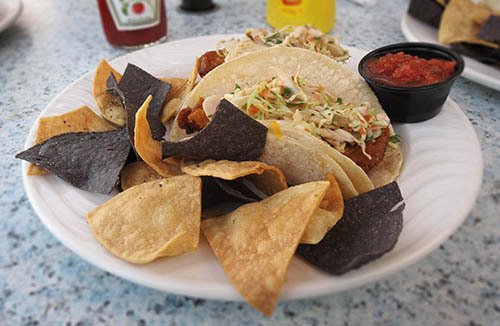 We shared a hearty lunch that included the Buffalo Burger, Chicken Sandwich, Shrimp Tacos, and Baja Fish Tacos. Eating outside, we walked over to the bar at Harbor Reef Restaurant and ordered a few Buffalo Milks. It doesn’t really get any better than that. Good company, beautiful view, hearty cuisine, and a delicious drink...I can really get used to island life! While the pace is slow at Two Harbors, time seems to come to a standstill here. If you’re looking to extend your stay on this side of the island, there is comfy lodging to be had. The Banning House Lodge is a historic 12-room bed and breakfast with spectacular views and a peaceful setting. There are also two beach cottages, Casa Santa Cruz and Casa Santa Rosa, both with stunning ocean views and full vacation rental amenities. Camping Cabins are small and intimate and available in the spring, fall and winter. A day at Two Harbors really is a great getaway without getting away. Home and the hectic Los Angeles landscape are only two hours away but it feels like you’re on the other side of the world while on this serene and tranquil slice of heaven.